Canon XA40 features a 1/2.3 – type CMOS Sensor along with DIGIC DV6 image processor. With Over Sampling HD processing this results in improved Full HD image quality. The XA40 features a lens with 20x optical zoom with 29.3mm wide angle. The combination of a 4K 1/2.3 – type CMOS sensor and DIGIC DV6 image processor delivers high quality 4K UHD images, and superior Full HD images thanks to Over Sampling HD processing. Recordings in MP4 UHD 150Mbps at 25P and Full HD 35Mbps/17Mbps at 50P/25P are supported. The Canon XA40 includes an Infrared Mode, allowing users to capture video in conditions with little to no ambient light. There is the option of recording in white or green mode. 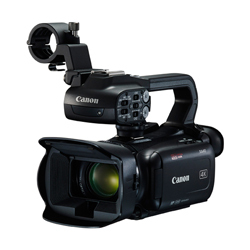 Canon XA40 weighs less than 1.2kg with a 3.0-inch LCD touch screen provides intuitive control. The highly portable camcorder also support linear PCM 4-channel audio, with built-in stereo mic and two XLR terminals. Additionally, two SD memory card slots are provided for simultaneous or relay recording.